For further details on this genre of painting refer to Mildred Archer, "Company Paintings" (1992), pg.43-66. With the continued decline of India's ruling classes and a shift in the patronage of art, artists of the Mughal/Muslim courts migrated to the new centres of art patronised by the British. Thus the Persian inscription suggests the work of a Muslim artist. 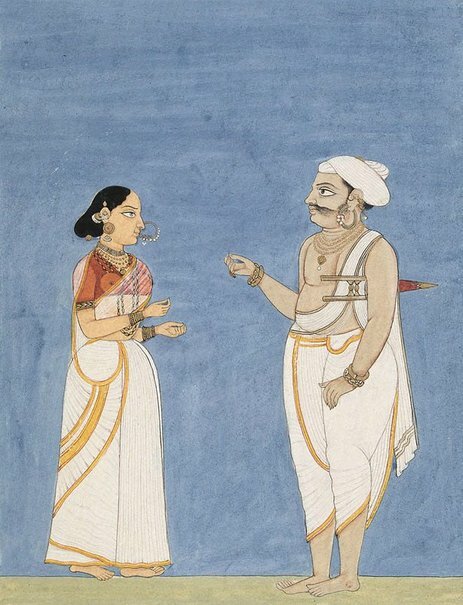 Stylistically these paintings conform to the Thanjavur style of Company school painting. (Refer to Chaitanya, 1994, "A History of Indian Painting: the Modern Period", pg.103). Asian Art Dept., AGNSW, 11 November 1997. Company school; probably by a Muslim artist working in Thanjavur. (see notes).